I enjoy trying trends. I don't try all of the big fashion trends, but I think it's fun to test out which ones work with my style. The printed pants trend is something I'm having a lot of fun with. These J Brand jeans have a nice balance--fun print with neutral colors. So fab - love those pants! Beautiful pic, love the location! Gorgeous!! Love the colors and pattern! I hope you visit my blog soon! i love those pants! i think i saw them on keiko lynn too- love them! Wow you look so pretty! The yellow suits you so well! So pretty as usual Taylor!! I love the yellow mixed with the floral jeans! I'm the same - I won't try everything but I will sometimes go for the more subdued version of a trend. You look gorgeous as always! I'm loving those pants on you! I haven't found a pair I'm absolutely in love with, but I'm still looking. Have a wonderful Sunday! I love those colours together! love the yellow on you! trends can definitely be on the ugly side sometimes. personally, i don't pay much attention to it. i love the creamy yellow of the blouse and i like the subdued colors of the print. You look awesome! I love your shirt, great color too. I am loving patterned skinnies! Great look! I LOVE those printed jeans! Too cute for words. great outfit i love the pants. beautiful location. This floral pattern is amazing! I would definitely wear these jeans. I love that this floral print is easy and neutral. Very cute look today! love these pants on you - especially with the yellow top! Those pants are amazing. Love them! Love the yellow with the flowers, the outfit is definitely polished and simple. I saw a girl wearing a similar pair of jeans at the movies a couple weeks ago and had instant envy! Such a fun trend right now! And I love the way you styled them! love your floral jeans girl! I don't try every trend either, I'm a little afraid to try floral pants. I worry they will make my legs look big. You pulled it off great though, as always. You look so fresh for Spring, Taylor! I couldn't pull off printed pants, but you do it so well! I've been eyeing those patterned pants for some time now but seriously couldn't imagine what I'd pair it with to help it shine! Love it with a little light button up...that pastel yellow really tones down the look...great pick! I’m hosting 5 days of GIVEAWAYS in honor of my blog’s 2yr anniversary…would love for you to stop by and enter to win! love your outfit - very cute blouse !! Absolutely fabulous pants! I also love the color blouse that you've paired them with- wise choice! I scored some floral cropped pants at a thrift store recently for $3. Thanks for showing an easy way to wear them! 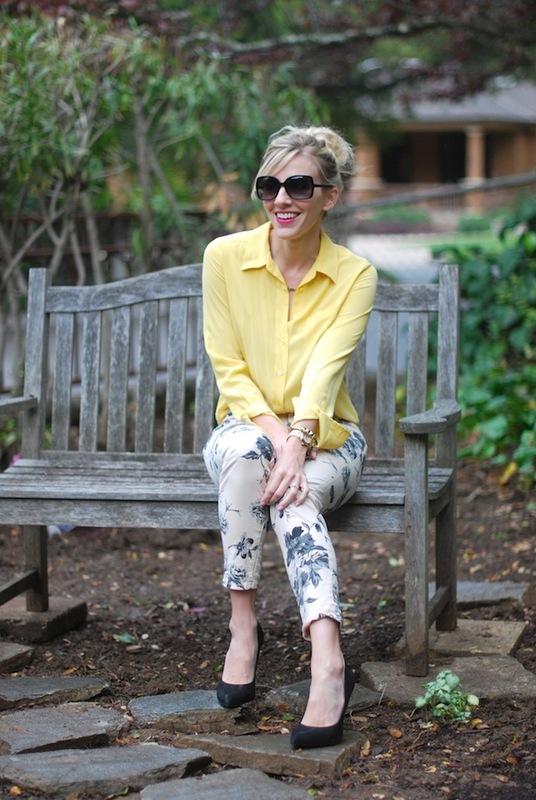 I am obsessed with floral pants at the moment and I love these paired with the yellow blouse. I want those J Brand floral print pants! to die and they look great on you with the yellow. Gotta love pants and flowers. If they are rolled into one, it is must have, Cool style. I looove everything that you're wearing!